A walk through any craft store in July will remind you that Christmas is on the horizon. This year, a stroll down the ornament aisle, revealed some emotions I wasn’t expecting. Surrounded by shiny silver balls and glistening angels, I was overwhelmed by feelings of dread as opposed to anticipation. But why was I so apprehensive about a season that was intended to bring such joy? CLICK HERE for my Rustic Glam Wreath Tutorial or CLICK HERE for my Wood Slice Place Card Holders Tutorial. In an effort to extinguish these negative emotions, I sat down that weekend and made a list of what I least looked forward to. After several bullet points, it occurred to me that maybe I shouldn’t focus on avoiding the negatives of the season. Instead, I should embrace the true significance of Christmas. In the midst of my Christmas funk, I decided to pick up a book I heard about from Lauren Gaskill’s podcast. 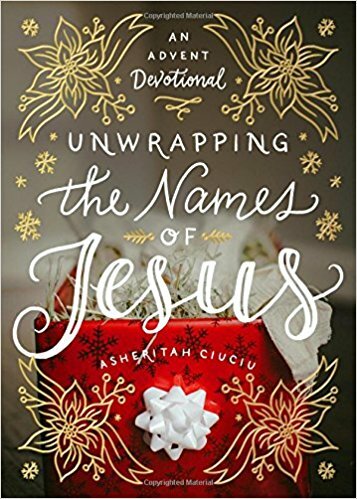 It is entitled Unwrapping the Names of Jesus, an Advent devotional by Asheritah Ciuciu. I was immediately drawn to her explanation of Advent and it’s forgotten significance. Until recently, I never stopped to think about what Advent really is and it’s purpose. Unfortunately, I’m not the only one. Asheritah explains in her book that Protestants took such a hard stance against the their former way of life that they also discarded some of the early church traditions as well. Advent is the 4 weeks leading up to Christmas, a time to reflect on the eternal significance of Christ’s birth. Traditionally, many would make an Advent wreath with four candles. One is to be lighted each week of Advent. Often each candle would have a theme such as hope, preparation, joy and love. Church historian Stan Norris explains in an article by Baptist Press, that Protestants are now beginning to embrace traditions once thought to be too liturgical or too high church. Norman states, “The focus on Christ inherent in Advent celebrations is needed in a cultural context in which we are battered on every side to be diverted away from that,” Norman said. What was once rejected as being too structured is now embraced amidst a culture of chaos and distraction. 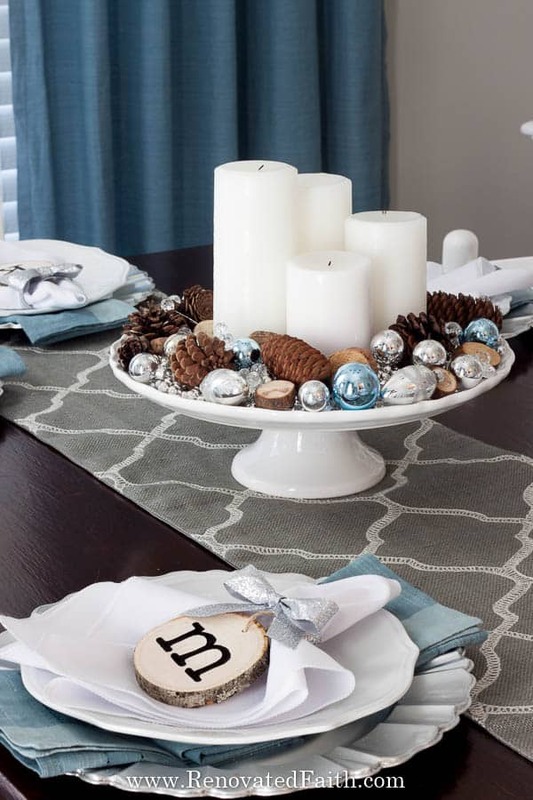 CLICK HERE for my tutorial on how to make Wood Slice Place Cards / Personalized Ornaments. So much of what we either dread or anticipate about the season is not where the true joy of Christmas lies. Christmas gifts, food and décor are all fine and good but their enjoyment quickly deflates when they are not sustained by a focus on Christ. Concentrating on those aspects alone is like eating colored sprinkles with no cake underneath. They are eye-catching and sweet for a time, but they don’t fill us up or satisfy what we truly crave. Why is Advent an Important Time on the Church Calendar? When God sent His Only Son in the fullness of time, the Jews were awaiting their Kingdom – their Promised Land. They wanted a forceful king to come in and overthrow Rome so they could enjoy their long-awaited Promised Land of Canaan. But God had the big picture in mind. So often, as God focuses on the eternal, we set our all too myopic glare on the temporal. Fortunately, God was much more concerned with setting His Love on us through His Son. In this way, the kingdom of Kingdom of God could reside in our hearts for all eternity. Our relationship with the Christmas season is often like the family that took first-time vacation to Florida. They settled in at the hotel and visited the pool in the morning. When it was time to leave the hotel, the kids didn’t want to leave the excitement of the pool. Little did they know what their parents had in store for them at Disney World that same day. The true gift of this season is not the food, the presents or parties. Those aspects are great but they pale in comparison to the gift of knowing Christ more. Ashteritah reminds us, “God promises than when we draw near to Him, He will draw near to us and reward us with more of Himself.” For there is no greater gift than Him. Unwrapping the Names of Jesus has reframed my focus on the true meaning of Christmas. Asheritah, who grew up as a missionary kid in Romania, helps us unwrap each name of Jesus. Like examining each facet of a beautiful diamond one day at a time, we see the beauty of Christ unfold. The devotional also includes tips for application. Her writing reminds us, as Dallas Willard so eloquently states, that we are the ones in whom Christ delights and dwells. CLICK HERE to see how to make my Wood Slice Place Holders and more images of my chandelier. An Advent Wreath is basically a tool to help you to reflect on the gift of Christ throughout the four weeks leading up to Christmas. It helps us to remember the birth of our Lord and anticipate his Second Advent or “Coming”. Candles – One candle is lit per week and each candle has a theme to help us focus on different attributes of Christ. As His Advent draws nearer each candle is lit and darkness is dispelled a little more helping us to contemplate the birth of God incarnate who came to redeem all of mankind. Circle – The wreath is shaped as a crown to remember Christ’s sacrifice on the cross. Also, the shape of a circle reminds of His everlasting grace, His unending love and our eternal salvation. 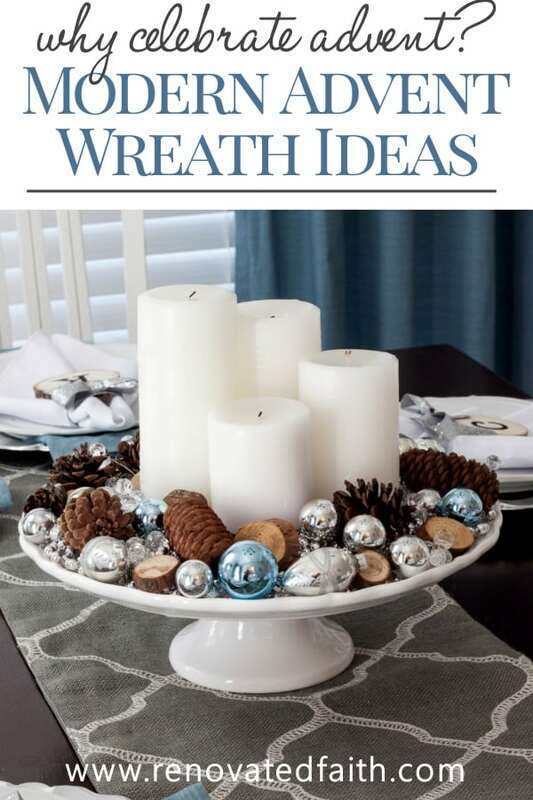 Upon reading this description, it dawned on me that our modern-day wreaths are ALL based on Advent wreaths. 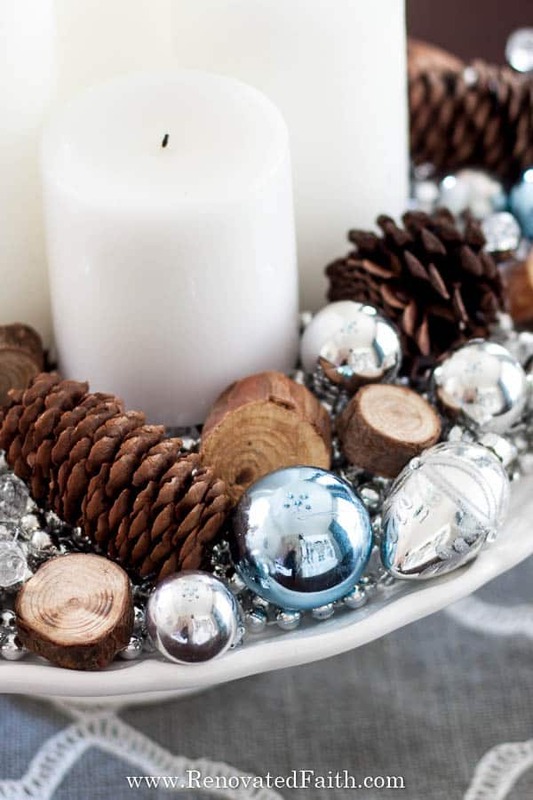 Holly, evergreen, berries and pine cones all symbolize different aspects of Christ’s sacrifice. I’ve made a lot of wreaths in my time but never a true Advent wreath (or known what to do with one for that matter). However, this year I put together a more modern Advent Wreath. I included some pine tree slices, pinecones, silver beads, and small ornaments. 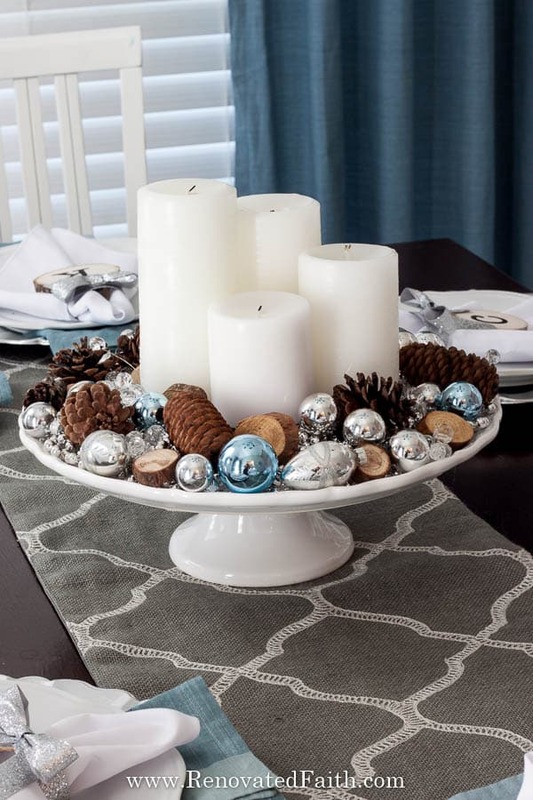 This “wreath” serves as our table centerpiece as a reminder to keep Christ at the center of our holiday preparation. What a comforting reminder that frees us from the hustle and bustle that this season can bring. Here’s another idea which include cranberries, which are said to represent the blood Christ shed on the cross. 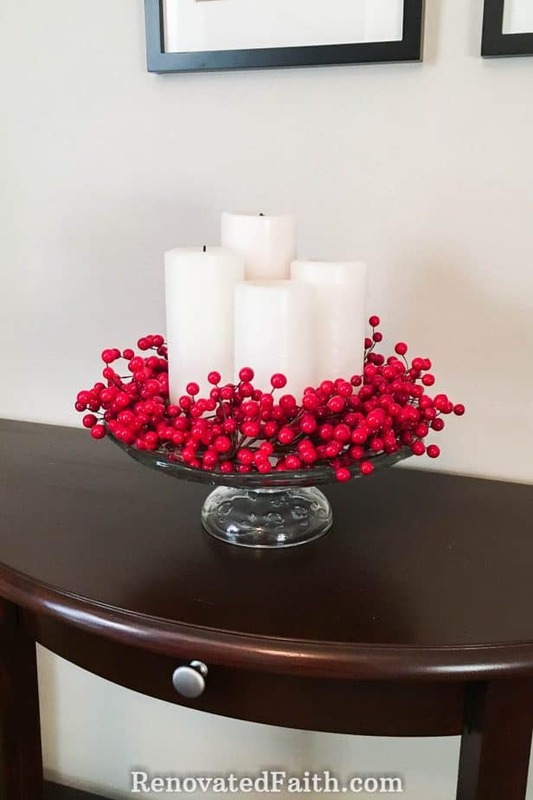 I used cranberry sprigs from Hobby Lobby and tucked them around the candles. No matter your budget, these are great advent wreath ideas for church and home. 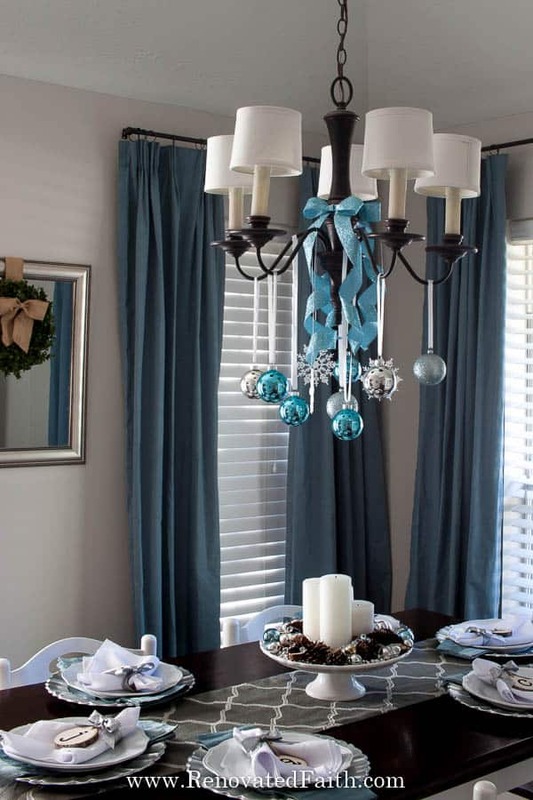 If you don’t want to make an advent wreath, here are some ideas online in multiple color and style options to match any decor. 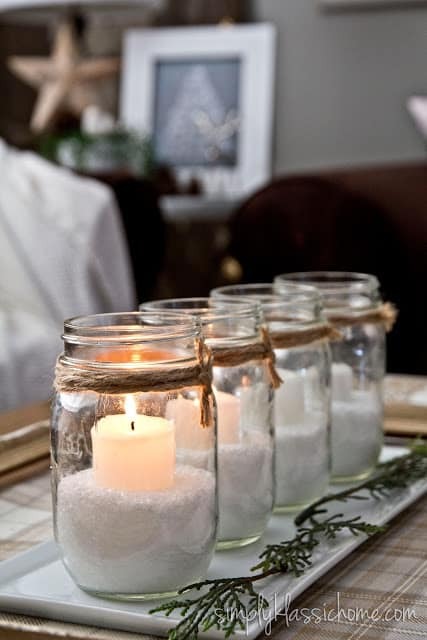 I love this Advent “wreath” from Kristin at Yellow Bliss Road, where she uses mason jars and a simple wood frame on her coffee table. When I read my devotional and spend time with Him each morning, I light the candles for that week of Advent. It helps me to center my focus on Christ as the true light of the world. Jesus transcended time and space to save each of us from our sin and to show us a love more abundant than we could ever imagine. Season of Advent 2018 – What About You? 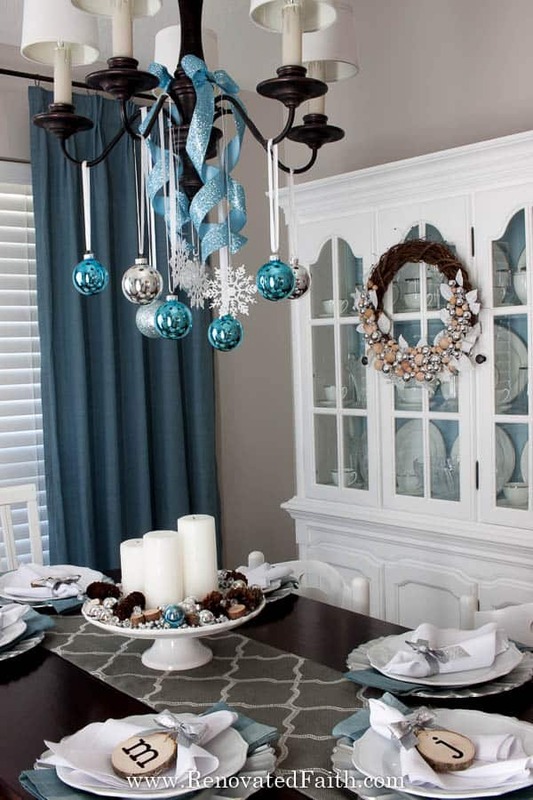 Do you find yourself dreading aspects of the holiday season? Give those things to Him. What are ways you can focus on the true significance of Christmas? I’d love to hear your thoughts and ideas in the comment section. How do you celebrate Advent and have you ever used an Advent wreath to help you remember the significance of this season? Please write your experiences in the comments! I’d love to hear ideas! 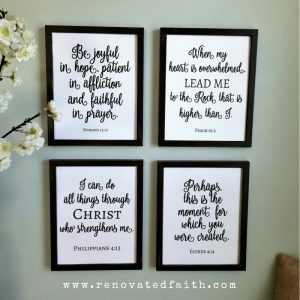 See the following posts for more faith-filled decor ideas. I loved this. I had never paid much attention to Advent like you said I think of the countdown calendar. This was a beautiful explanation of what Advent is for those of us that don’t really know much about it. Amazing. Thank you for sharing this. I know, right?!? I don’t know how I missed out on such a cool tradition! Thank you for your kind words and for stopping by Rachael! Just reading about the advent made me understand it a lot more than I ever had. I knew it was the four candles that one was lit each week but I never knew the meaning of why. Very nicely put. Thank you so much for your sweet comment Shirley! Have a Merry Christmas!